Kids grow up as natural scientists, curious and eager to learn everything about the world about them. So why do so many children grow up learning to hate the sciences? One reason is because we forget to show kids all the ways that science is part of their daily life—and also really fun! 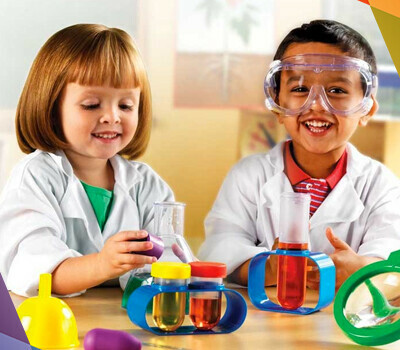 At Amazing Explorers, we put together 3 fun science experiments you can do with your preschooler to help them learn to love STEM early and get ready for the 21st century. Just remember that even the smartest young scientists need the supervision and guidance of their favorite adult assistant. Ready? Let’s do science! A clear vase or mason jar for each flower you plan to use. First, fill up your vases a quarter full of water, then put in about 10-20 drops of food coloring. Then the adult assistant will trim each flower before placing them in their own separate vase, preferably by the window. Ask your scientist to make a hypothesis. What do they think will happen when the flower drinks the water? Then check every few hours on the flowers to see what’s changed. Before 24 hours are up, you should have a colorful new group of carnations! Bonus: See what happens if you split a flower’s stem in two, then put each side of the stem in different colored mason jars. You might be surprised with how it turns out! To make your lava lamp, fill the bottle about two thirds of the way with oil. You’ll want to add just enough water so that there’s still an inch left at the top. Then add a few drops of food coloring—any color you’d like! These will slowly break through the oil and begin to dye the water. Try and wait for that to happen before starting the next step. Now this is the fun part. Break an Alka-Seltzer tablet into three or four pieces, and watch what happens when you put one (just one!) inside your bottle. Kaboom! It’ll fizz until the tablet completely vanishes in the water, leaving you with one groovy lava lamp. Before your young scientist steps in, the adult assistant has some preparation to do. First, fill the mason jar with water until it’s ¾ full. Then mix the food coloring with some water in a separate, small cup. Put the droppers in each cup of colored water. Finally, put shaving cream in the mason jar until it’s just peeking over the top. Ready to make your own personal rain cloud? Ask your scientist to squirt colored water from the dropper into the cloudy jar. After two or three times, you should notice the cloud is beginning to “rain” down colorful dye! So, how does it work? The shaving cream floats in the watery mason jar just like a cloud floats in air. When the cloud gets too heavy with colorful dye, it “rains” into the jar just like a real raincloud! Science isn’t just fun—it’s essential. At Amazing Explorers, we believe that tomorrow’s great minds are in today’s classrooms. That’s why our innovative STEAM learning programs are specifically designed for the 21st century learner, and aimed towards giving them the tools they need to successfully deal with the challenges of the future. Is your scientist ready for adventure? Schedule a tour with us at our Oviedo, Waterford Lakes, Winter Springs, or Lake Nona locations. We’d love to show you how we foster a nurturing environment for the great minds of the 21st century.